For dust-free and healthy work environments. Sanding can generate fine dust that could be extremely hazardous to health. MENZER industrial vacuum cleaners are designed specifically for the removal of fine dust. When combined with one of our MENZER sanders, they ensure a safe work environment with very low dust levels. They can, of course, also be used as standalone industrial vacuum cleaners: The wet & dry vacuum cleaner models MENZER VC 760 and VC 790 reliably remove dry as well as wet dirt and liquids. 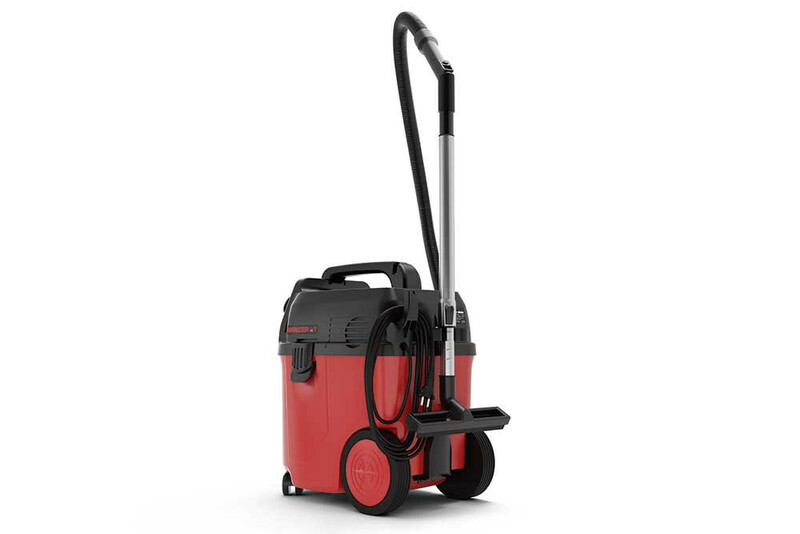 The backpack vacuum cleaner MENZER VC 660 M is a dry vacuum cleaner that ensures optimised mobility when vacuuming. Industrial vacuum cleaners for professional use have to comply with very high requirements: As a dry vacuum cleaner, they have to remove dust, dirt, chippings and debris. As a wet vacuum cleaner, they must reliably remove moist or wet dirt as well as liquids. In the guise of an industrial or safety vacuum cleaner, they must connect up to sanders to remove fine dust generated at the source. MENZER has developed a range of industrial vacuum cleaners to take care of these varied and completely different tasks. They are designed to satisfy highest commercial and professional requirements to make work easier and safer. MENZER industrial vacuum cleaners are also specifically suited to the various dust extraction requirements of interior work and in combination with our MENZER drywall sanders, they offer optimised protection against health-hazardous fine dust. Our highly robust MENZER industrial vacuum cleaner models VC 790 PRO and VC 760 are amazingly versatile. As a wet & dry vacuum cleaner, they can be used universally in any environment and can deal with dry, moist or liquid dirt and residue of any kind. The shock-proof plastic containers are available in a 25 l or 35 l size. This huge container volume allows the uninterrupted removal of large volumes of dirt, dust or liquids. 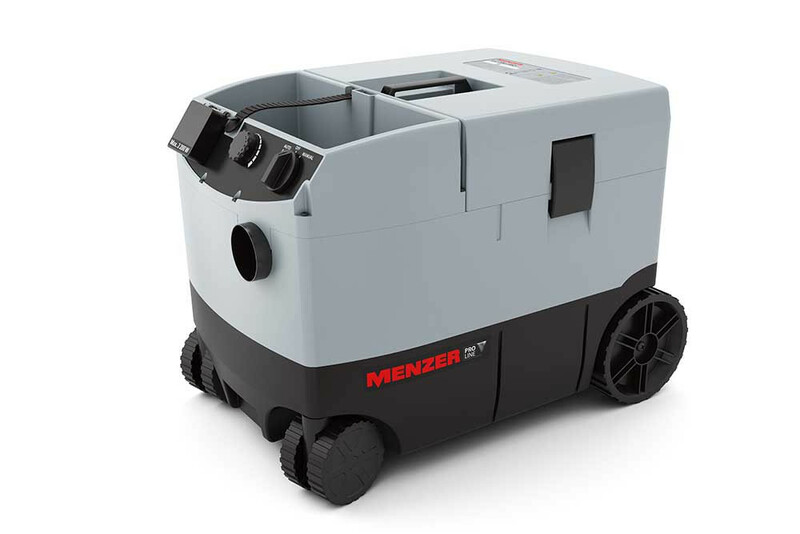 MENZER industrial vacuum cleaners come equipped with an integrated power socket for the connection of electric tools like drywall sanders. Innovative filter systems ensure uninterrupted and efficient work conditions for dry vacuuming or in combination with a drywall sander. An automatic filter cleaning system based on flat filter vibration (VC 790 PRO) or multi-cyclone technology (VC 760) prevents filter clogging. As a result, vacuum performance remains constant and fine dust is removed with permanent reliability. No more downtimes for manual filter cleaning! MENZER industrial vacuum cleaners come with a wide range of smart accessories to change over to wet vacuuming quickly and easily. An electronic fill level control unit automatically deactivates the vacuum cleaner, once the max. fill level is reached. PRO LINE by MENZER satisfies the highest industrial requirements for intensive and continuous operation. MENZER VC 790 PRO is designed specifically for long and efficient work sessions and is used wherever a task requires constantly high suction performance and maximised power. Our MENZER BASE LINE machines are the perfect choice for semi-professional applications. The industrial vacuum cleaner models MENZER VC 760 and VC 660 M ensure efficient and continuous operation for cleaning tasks, interior work and renovation projects.